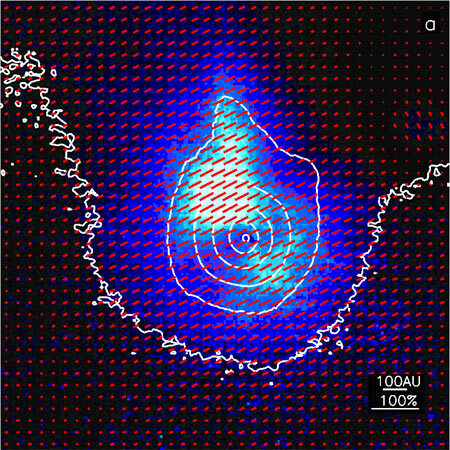 An international group of astronomers has used the Coronagraphic Imager for Adaptive Optics (CIAO) on the Subaru telescope in Hawai'i to obtain very sharp near-infrared polarized-light images of the birthplace of a massive proto-star known as the Becklin-Neugebauer (BN) object at a distance of 1500 light years from the Sun (Note 1). 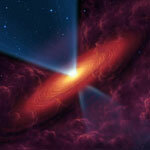 The group's images led to the discovery of a disk surrounding this newly forming star. This finding, described in detail in the September 1 issue of Nature, deepens our understanding of how massive stars form. 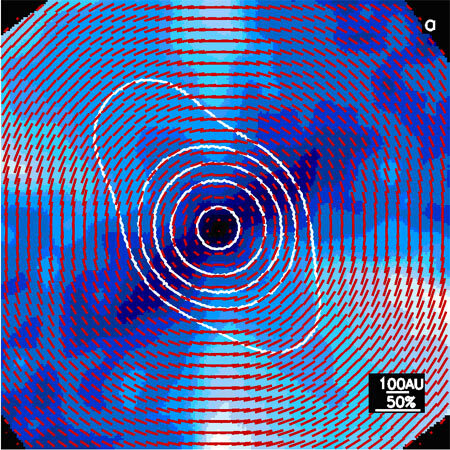 The research group, which includes astronomers from the Purple Mountain Observatory, China, National Astronomical Observatories of Japan, and University of Hertfordshire, UK, explored the region close to the Becklin-Neugebauer object and analyzed how infrared light is affected by dust. To do this, they took a polarized-light image of the object at a wavelength of 1.6 micrometers (the H band of infrared light). Images of the brightness of the object just show a circular distribution of light. However, an image of the light's polarization shows a butterfly shape that reveals details that are undetectable by looking at the brightness distribution alone. (Figure 1) To understand the environment around the star and what the butterfly shape implies, the astronomers created a computer model for comparison (Figure 2), along with a schematic of star formation (Figure 3). These models show that the butterfly shape is the signature of a disk and an outflow structure near the newborn star. This discovery is the most concrete evidence for a disk around a massive young star and shows that massive stars like the BN object (which is about seven times the mass of the Sun) form the same way as lower-mass stars like the Sun. There are two main theories to explain the formation of massive stars. The first states that massive stars are the results of the mergers of several low-mass stars. The second says that they are formed through gravitational collapse and mass accretion within circumstellar disks. Lower-mass stars like the Sun are most likely to have formed through the second method. The collapse-accretion theory assumes that a system has a star associated with a bipolar outflow, a circumstellar disk and an envelope, while the merger theory does not. The presence or absence of such structures can distinguish between the two formation scenarios. Until recently, there has been little direct observational evidence in support of either theory of massive star formation. This is because, unlike lower-mass stars, newly forming massive stars are so rare and so far away from us that they have been difficult to observe. Large telescopes and adaptive optics, which greatly improve image sharpness, now make it possible to observe these objects with unprecedented clarity. High-resolution infrared polarimetry is an especially powerful tool for probing the environment hidden behind the bright glow of a massive star. 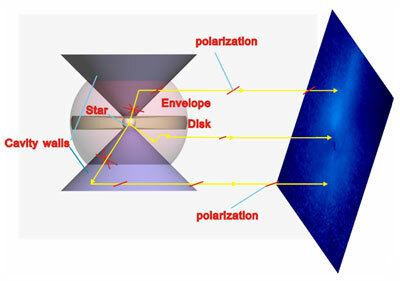 The group’s success in detecting evidence for a disk and outflow around the BN object through high-resolution infrared polarimetry suggests that the same technique can be applied to other forming stars. This would allow astronomers to obtain a comprehensive observational description of the formation of massive stars greater than ten times the mass of the Sun. Figure 4. Sketch of dichroic cloud that produces a parallel polarization pattern. (Larger Image). Figure 5. Orion, the most famous winter season constellation in the northern hemisphere. Inset images are the optical image of the Orion nebula (left bottom) and infrared image of the central region of the nebula (upper right). The BN object is located within the red circle. Figure 6. 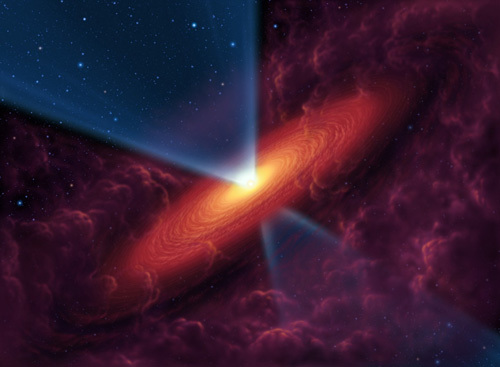 An artist's illustration of a circumstellar disk and outflow cavity around a massive star. The envelope is shown to be partly transparent so that the disk is easily seen. (Larger Image). Note 1: The BN object was discovered in 1967 by Eric Becklin and Gerry Neugebauer during their near-infrared survey of the Orion Nebula region, and has been regarded as a prototype of massive protostars. It is one of the brightest infrared objects in the sky, but invisible at optical wavelengths except for the foreground nebula. 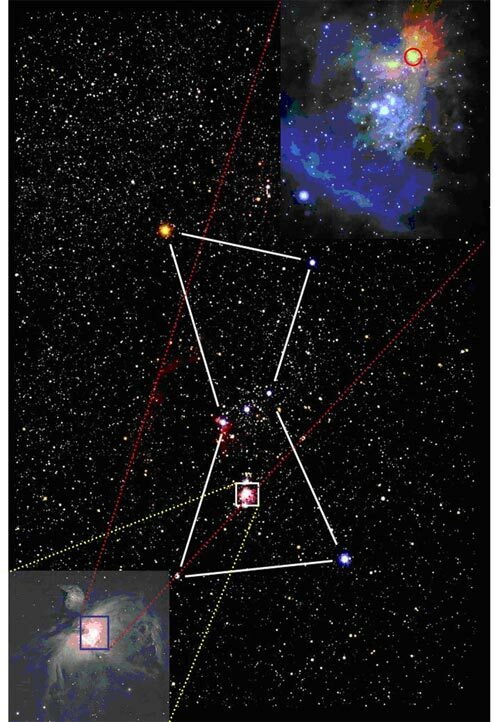 The Orion constellation and an optical image of the Orion nebula, an infrared image of the central region of the nebula, and the position of the BN object is shown in Figure 5. 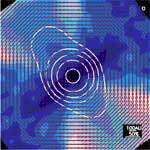 Note 2: Polarized light generally exhibits a so-called central-symmetric pattern, as shown in Figure 2. However, in the BN system astronomers observed a different polarization pattern, with the polarization vectors parallel to each other. This is caused by an effect called "dichroic extinction." If elongated dust grains exist in a foreground cloud, they tend to align perpendicular to the magnetic field of the cloud. These grains would block more light polarized in one direction than in the other. 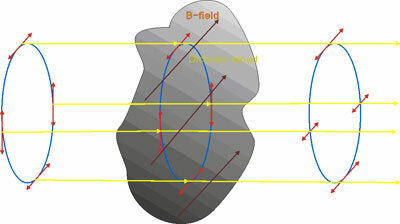 Therefore, when light emerges from the cloud, it will be polarized parallel to the magnetic field, as shown in Figure 4. This process happens more frequently in hot dusty clouds than in cold clouds, since in hot clouds dust particles would be more easily aligned.